I find a new mascara launch hard to resist; as the one piece of makeup that I am never without, and definitely my number one desert island product, Mascara is undoubtedly the one product I never regret splashing out on. I firmly believe that there are amazing mascaras out there whatever your budget (I’ve revealed my love of the Seventeen Falisfeyed 3D mascara many times!) but if you can afford to spend a little more on a mascara, then you’ll want to check out these mascaras! 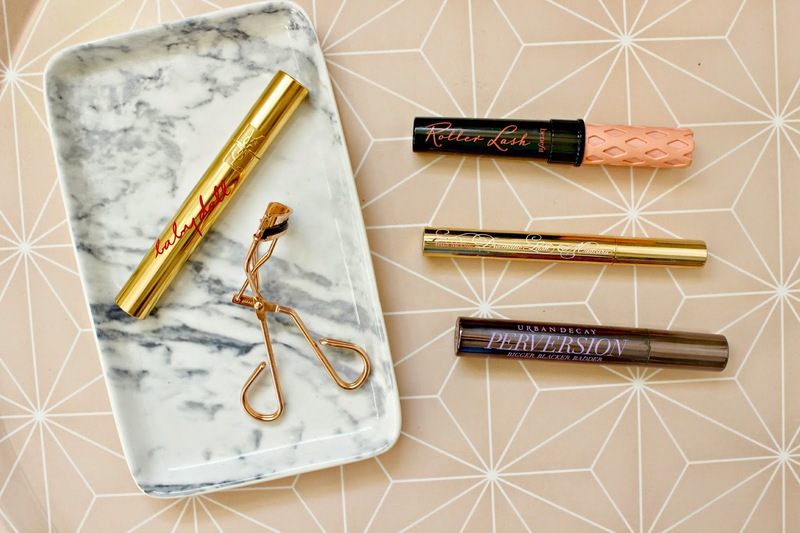 For separated lashes, & a doe – eyed look: Benefit Roller Lash. I featured this mascara in my February Favourites because with this mascara it was love at first swipe. With a wand that’s inspired by hair rollers, the spell works in a similar way to velcro rollers which grab the lashes, pull them upwards and curl, while setting them in a glossy black coat of mascara. This action gives you an eyelash perm and separates to the max. For eyelash curler users you’ll find you can leave them out of your routine if you’re using Benefit Roller Lash, and the bristles hook onto the tiniest of eyelashes, and as the opening of the tube has a built in wand-wiper, you’ll never overload your lashes. Yes, I’m shallow and I kinda wanted to get it because the packaging was pretty, but it’s the results that make this mascara a winner for me. For fluttery, defined lashes: YSL Babydoll. Housed in YSL’s iconic gold mascara tube with Babydoll scrawled down the edge, the Babydoll mascara has a lot to live up to following YSL’s previous mascara triumphs. The brush is chunky but with stiff, short bristles and there’s a mix of wide and fine bristles which are designed to add definition. If your lashes are naturally long, but fair then you’ll notice a huge difference with this mascara as it thoroughly coats each individual lash, but it may not be the one if you have shorter lashes. The formula is an inky black, and delivers a non crispy finish so it doesn’t flake or smudge. If you can handle the price tag (an eye-watering £24.50) and can’t resist the bling tube, then you need to add this mascara to your collection. For mascara that conditions, & doesn’t budge: Trish McEvoy Dramatic Lash. One that you don’t hear much about on UK beauty blogs (probably because they don’t have a UK PR to be honest…!) but this mascara delivers serious results on all it’s promises; full, long luxurious lashes and a lash conditioning long-wear formula. One swipe of this mascara will coat lashes in a glossy formula which lashes love, and each lash is surrounded with a tube of mascara which makes their volume and length almost double. The formula envelopes lashes in such a way that you have to remove it by swiping your cotton pad down the lashes; imagine your wiggling your lashes out of a tube of mascara! Oh and it’s seriously long lasting; I can apply this on a Friday morning and it will still be there on Sunday. Don’t ask me how I know this. Just don’t. For big, fat, chunky lashes: Urban Decay Perversion Mascara. I got my hands on this mascara after several people who I’d approached in a weird way asking what mascara they used told me that it was this one. Do you ever do that? I was stood really close to a girl in a lift and couldn’t stop staring at her lashes, they were so BIG! I asked her what mascara she used and it was this, then a few days later a similar incident occurred, and again it was Perversion. The mascara, not my staring! Well, maybe both. Anyway the Urban Decay Perversion Mascara is available to buy by itself, or in a set with a lash primer. I use the primer to give a creamy base coat to my lashes, then apply Perversion. The brush is a ginormous bristly brush and you can build layer after layer as it dries quite quickly, but you probably won’t need too many as the volumising brush separates and defines but lays a generous amount of product to each lash. It should come with a warning though; girls will come up to you asking what mascara you use, and you’re boyfriend will be like; Why are you wearing false eyelashes in the day?! The one I can’t wait to try: YSL Luxurious Mascara for False Lash Effect. YSL sure know how to build hype around a mascara launch (just check out the video below!) and the new YSL promises to give a false lash effect in one single stroke. Sounds too good to be true but after the Babydoll delivered on all its promises, I have high expectations. The formula contains 4 oils which condition the lash and leave them more flexible, supple and lengthened. Have you tried any of these mascaras? What’s your favourite luxury mascara?